Throughout life we meet people that make impressions on our lives, and we also meet people that we could care less if we see them again. I hate to say it, but it’s true. In the short time that I had to get to know this next Sundays with Friends featured blogger, she made quite the impression. She and I would talk about various random things during our times together, and I’m still trying to picture her dancing in a club somewhere before her handsome baby boy was born – and I do mean handsome…absolutely cute). Nevertheless, she has remained in my thoughts, and I was so thrilled that she wanted to do a featured blog on here for you guys. She’s full of wit, love, Southern Belle traits, and a dash of OCD it seems after reading this. *smiles* Thanks again, Susan, for joining us! I feel the need to preface this blog with the fact that I am not a cook. Not even close. I am a follower of recipes (being that I am annoyingly OCD) but it’s the nuances that always get me. The “feel” that some people have for cooking is just beyond me. I can follow a recipe, but I can’t “wing” anything but the occasional grilled cheese sandwich. I need a plan and all the right utensils laid out for me in an organized manner. Cut and dry. This is why being offered a guest blog with The Onyx Plate is such a huge honor for me. This is also a contributing factor to why learning how to can vegetables over the past couple of years has been such a treat for me. It’s pretty cut and dry. It’s hard work, but it’s not rocket science. 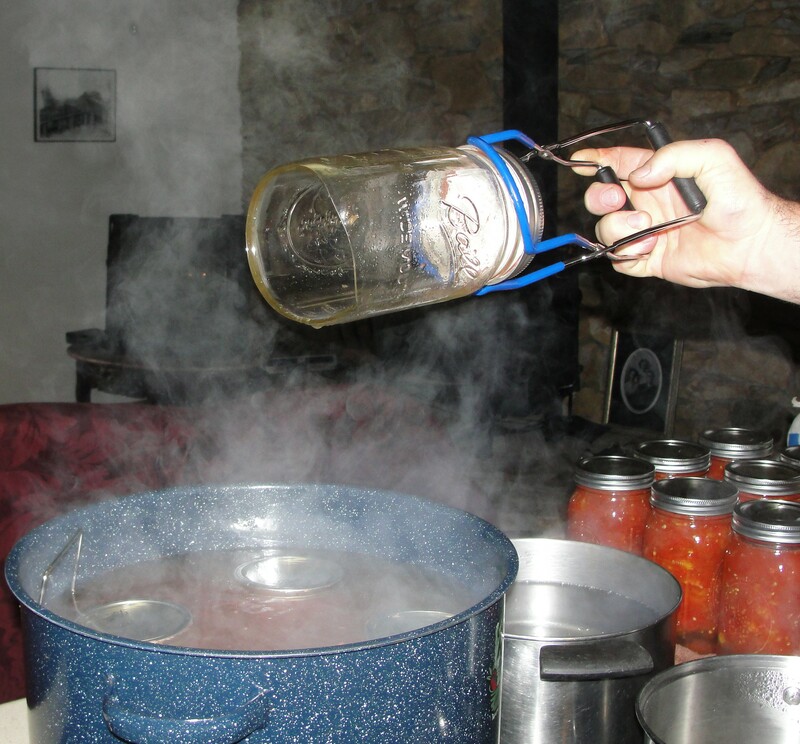 Now pressure cooker canning is a different story, but if you are like me, the water bath canning used here will give you a good start and get your canning juices flowing and you will be making your own spaghetti sauce and apple butter in no time. When I was little, we always had pickles that came from my great-aunt and uncle. They lived in a little house downtown in the tiny city of Reidsville, NC and their entire yard was used as a garden every year, including the small strip of grass that ran between their fence and the drive-way. There was barely room to walk. My Uncle Lewis would have tomatoes and cucumbers everywhere and trellises that would help the vines grow well over my head and even his. It was always fun for my sister and I to go over and help them pick their vegetables and I always took a moment to stick my nose into the large butter churn sitting next to the kitchen door that had my Aunt Elsie’s pickles soaking in it. 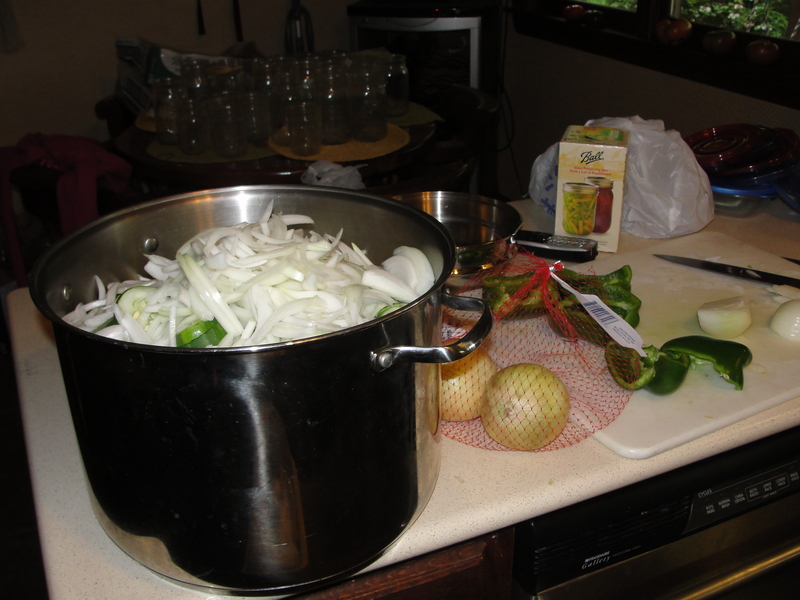 I was around a few times when she would drain the brine that covered the pickles and stew up some other concoction to put them in. I didn’t know what all went in to making pickles, but I knew it took ages (as most things over a day or so tend to translate to a 5 year old.) I really thought this was the only way to do it, so when we had a huge surplus of cucumbers this year, I asked my Mom to bring her old butter churn with her when she came up for the weekend so we could make pickles. You see, my husband and I are both Southerners, he from Alabama, and myself from NC, but we are just in the past 4 years getting back to our roots after living life in the big city. 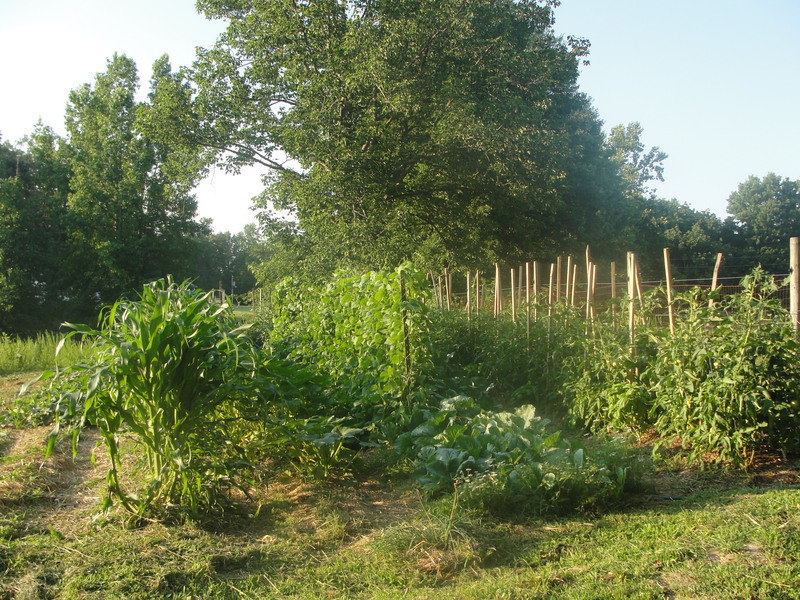 We have had a garden every year since moving to an 87 acre farm and it grows every year in size and variety. Some things work out and some things don’t, but I can’t tell you the joy that we get from growing our own food. It’s mainly Paul’s job these days since we have a two year old, but I have no doubt that our little man will be out there helping before too long and I will be able to get out there as well. For now though, he is grower and picker and I am the canner and freezer. Starting the pickle adventure, I did what I normally do with anything else – I looked it up on my iPad. 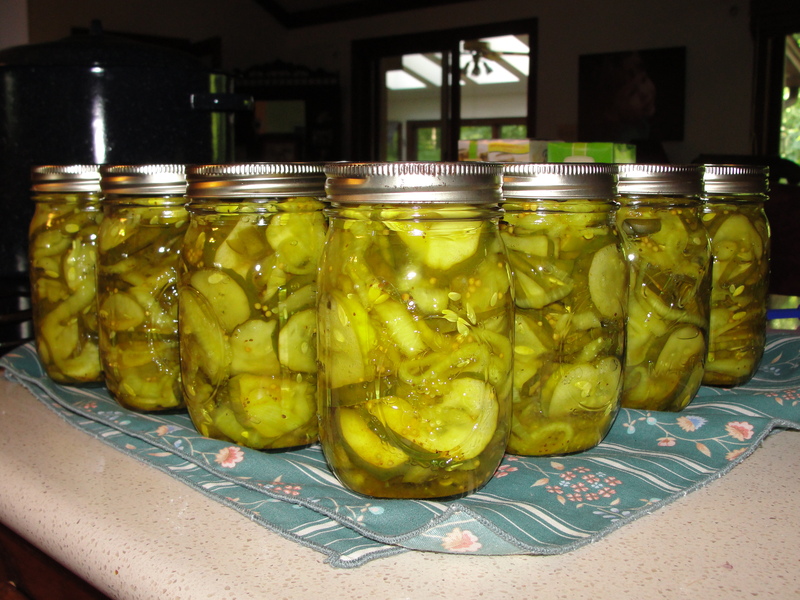 If I had done this before my Mom came to town, she wouldn’t have had to bring the churn because, as it turns out, you don’t need to soak bread and butter pickles for days. I had no idea, so thank goodness for online recipes and blogs. You will, however, need a water bath canner. I got mine at the farm supply nearby and it came with all the utensils that you will need including a jar rack, tongs and a funnel. I used a recipe from Allrecipes.com that seemed pretty simple. 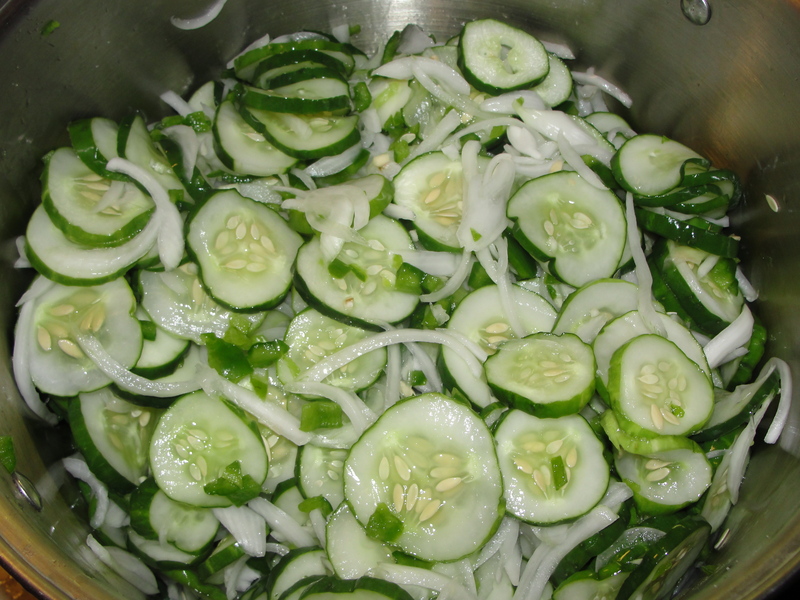 The recipe tells you to mix the cucumbers, onions and green peppers with the salt and let it sit for about 3 hours. Apparently the salt draws out the water and makes the pickles crispy, so I cleaned off all the cucumbers and started cutting. I didn’t actually count how many I used; I just filled our enormous stew pot that we keep around for crawfish boils and frying turkeys. I learned after the first batch to go ahead and mix as you go so that it doesn’t take so much effort later on. I would also layer in salt as you go so that way you don’t have to mix that huge pile of veggies as much. It is next to impossible to mix unless you just dump it out in sections and mix it and then dump it all back together. I also put a layer of ice on top when I put it in the fridge. I am not sure why, but my Mom told me to so I did and I will do it again for that very same reason. 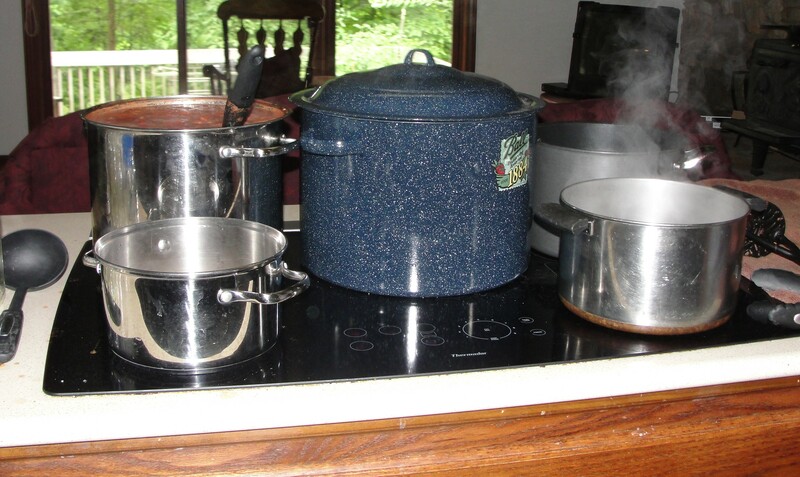 Just before the three hours is up, put the lids of your jars in a pan with simmering water and also heat your jars. If they are already clean, you can just put them in the dishwasher on the “dry” setting. If they aren’t clean just put them through a whole cycle, but the point is that you have them hot when you put them in the boiling water so they don’t burst. After the cucumbers are done with their 3 hr soak, mix up all the other ingredients and bring it to a boil in a saucepan while you are draining off the excess water from the pickles. This is where the comments on the web site came in handy because quite a few of them suggested that it would be a good idea to rinse off some of the salt. I did, and they turned out great. 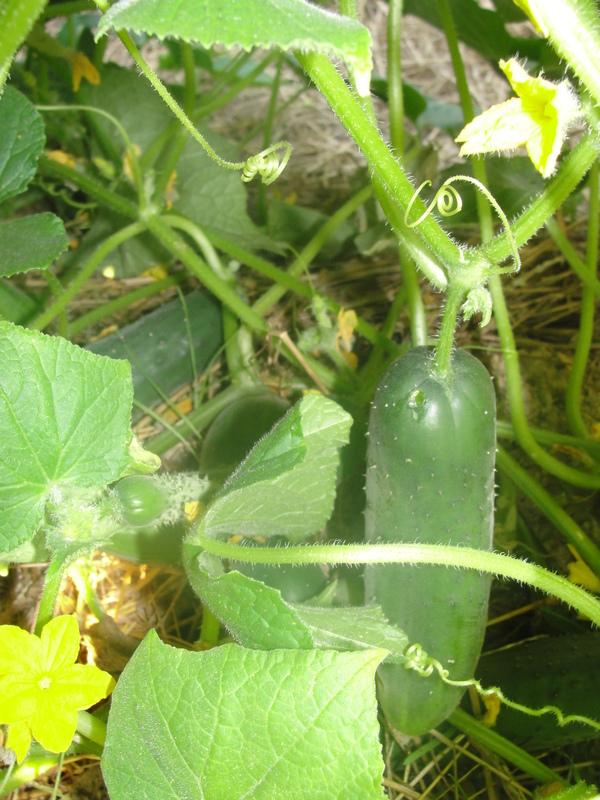 Once you rinse the cucumbers off and put them back in the big pot, pour the boiling liquid mixture over the cucumbers and stir. Once again, this is next to impossible because even with the liquid you just put in, there isn’t enough at this point to make it possible to stir. I tried using a big spatula and ended up with a living room full of semi-cooked pickles and a dog looking at me as if to say, “Thanks, but I am not really into pickles, Mom.” Don’t worry though because as it heats up the cucumbers cook down and there will be more liquid. It says in the recipe to heat this mixture until just before it boils. Personally I thought that was kind of funny. It’s either boiling or it’s not right? Maybe that’s part of the OCD I mentioned before, but I waited until they were kind of steaming a little and stuck my finger in the pot. When it got to the point that it started to sting a bit, I decided they were ready. Once you decide that it’s almost boiling, you can put the pickles in jars. The pickle juice kind of glows fluorescent green/yellow, which does not go with my décor, so you can put down a towel if you like, but I have found a little cleaner with bleach, cleans it right up. I have not found anything that gets it off my towels though, so it’s up to you. 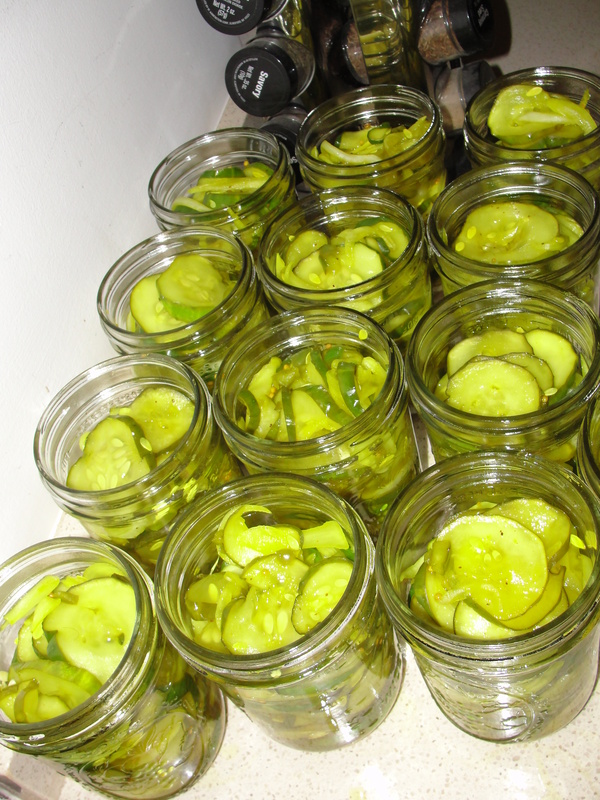 I used a slatted spoon to get mostly pickles in the jars first and then we tapped them down and topped them off with a few more and then covered them in the juice leaving about an inch of head space in the jar. (For those of you who have never canned anything, that means that you leave an inch between the top of the jar and the pickles- I say this, because I had to ask myself.) Make sure there are no air pockets in the jar and wipe rim of the jar with a clean cloth and put on new lids and screw on tops. Place the jars in a boiling water bath with at least an inch of water covering the tops for about 15 mins after it starts boiling again. Be careful putting them in the bath because sometimes you will lose the bottom of a jar because you didn’t have it hot enough to begin with or just because stuff like that happens. If it does, you will hear it ‘pop.’ If you are the one holding the jar with the tongs, start screaming and yelling for someone to hand you the dad gum spatula and hold the trash can for you and don’t pull the jar out of the liquid until you have a spatula underneath it, or not only will you have glass in the water, you will also have a pint of pickles floating in there. The louder you yell, the harder everyone thinks that the job is and therefore the more they will like the pickles. It’s a fact. But don’t let anyone eat the pickles out of the pot with the glass in it no matter how much they beg. 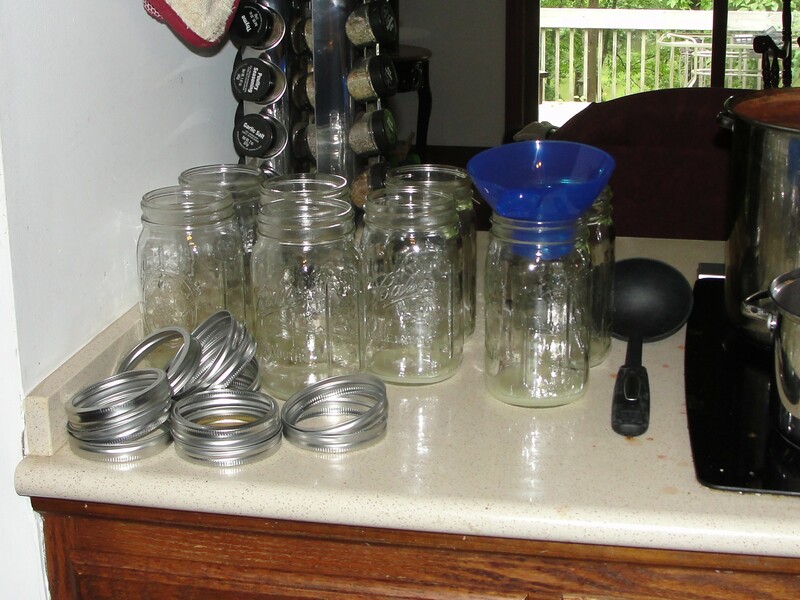 After they are done boiling, take them out and let them cool on a towel and make sure that the jars are sealed by pushing on the top – it should be concave and should not pop in and out. If it does, just put that jar in your fridge and eat it. You deserve it after all that canning! Great blog! It makes me actually think I could make pickles! Great job Susie! You paid way more attention to what Elsie did with those cucumbers than I ever did.